Hunting down pools with lanes or beaches without waves, can be an interesting challenge while traveling. A few days ago I completed my first olympic distance triathlon. It was just my style, no roads involved. Off-Road Triathlons, also known as Cross Triathlons or by brand name, XTERRAs are a special breed of race. 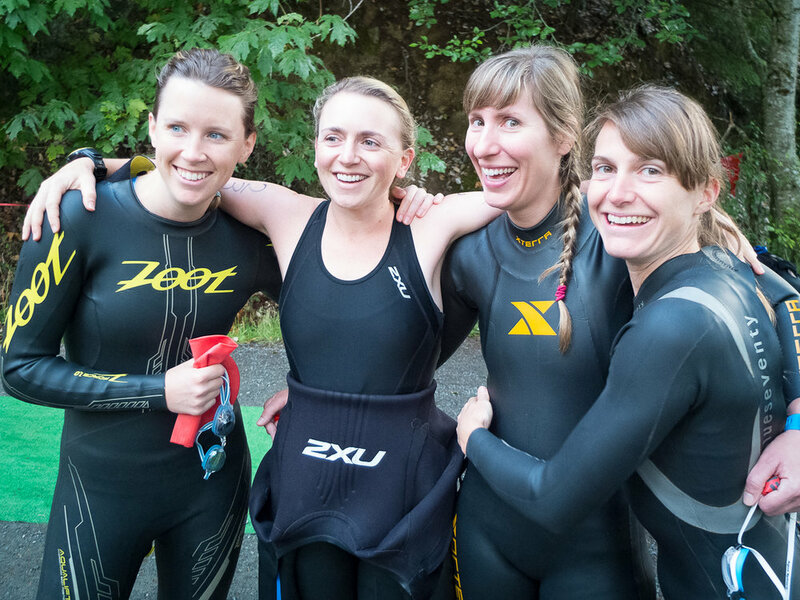 These races take competitors through a 1.5k swim with a quick transition into a 24k mountain bike ride, followed by a 9k trail run. The race I participated in was in Victoria, BC, in and around Durrance Lake. The course has a reputation of being one of the most technically challenging on the circuit, perfect for a mountain biker from Whistler like me. As I transitioned from swim to bike to run, last Sunday, pushing my body harder than I'd ever done before, I thought about the countless hours of training I had undergone in the last 8 months. I decided I now know three precious things about training about Off-Road Triathlons, that I wish I could tell "past me" at the start of all that training. First, there will be some high highs and really low lows. Training is an experiment. There were times when I felt strong and capable but those typically only came out in the taper and on race day. With such a high volume of training I mostly felt sore and tired. But, it gets better and it's worth it. There were also a few occasions when I pushed myself too hard and physically couldn't motivate. Dear "Past Me", be prepared - training is hard work. When I first started racing bikes, I wasn't really concerned with what I ate and when, but it really does make a difference. Depending on the effort and the food I've packed, I like to take in a gel or shot block every 30-45 minutes. The only times that I've been in a really dark place (read: wanted to end my training session or pull out of a race) I can blame my poor nutrition timing. I can't say that I have this completely dialed, yet. A work in progress! Make a triathlon training plan for yourself, and stick to it. I'm lucky enough to have found a an awesome coach (shout out to Jen Segger) and digital performance dashboard (Training Peaks) to keep me excited about recording workouts and sticking to a plan. Hello accountability and gamification! Pairing that with all the other fitness and social ride/swim/run groups and I could have easily done double the training and burnt out months ago. I found my success stemmed from sticking to Jen's plan and only adding in group training when it matched up with my prescribed workouts. That being said, there are huge benefits from group training so I forced myself out of my solo comfort zone once or twice a week to train with local legends like Munny Munro or Kristian Manietta. If you're considering the wonderful, challenge of training for an off-road triathlon I have one last piece of advice, do it. Needless to say, I may not have brought home any trophies but the bond with my training buddies Liz, Marissa & Emma and the powerful new understanding of my limits will keep me coming back to compete year after year. Want to see more snaps from the event? Follow me on Instagram. A huge thank you to Dan Harmon for these lovely photos. Follow him on Instagram here. Updates? Get Em' While They Are Hot! Sign up with your email address to receive news, articles and blog posts from work and play in the outdoors.